An easy example to understand how a Line Laser Level can be used is to imagine you want to install a chair rail around a room. The hard part about this job is making sure the chair rail is level and the same height from the floor on all four sides of the room. To do this job right, you will need to make several measurements and marks on the walls of both height and level with a tape measure and traditional bubble level (or spirit level). 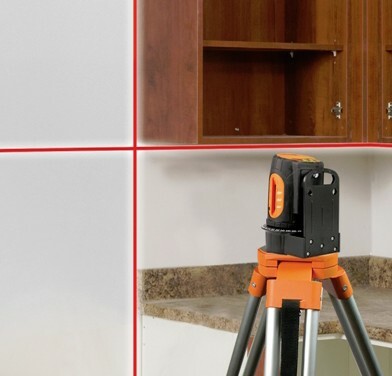 With a Line Laser Level, however, you can place the Line Laser Level in the center of room on a Tripod. When you turn on the Line Laser Level, a beam of light projects 180° horizontally and vertically in the room at the same height. You can then adjust the tripod to get the exact height you need (for chair rails this is typically 1/3 up the wall, or 32"-36" for an 8' ceiling). With the laser beam of light continually projecting a horizontal and vertical line in the room, you can now effortless install your chair rail around the room with confidence it is perfect. Other application examples where a Line Laser Level may be useful would be installing kitchen cabinets where multiple counter-tops and top-cabinets need to be level around the room; leveling a floor, drop-ceilings (acoustical ceilings) in a basement wreck room where the ceiling tiles need to be the same height around the room; and framing a room, again say a wreck-room where you want your studs to be even across the room so your drywall will attach evenly. 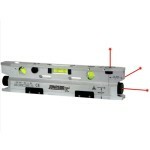 In this last case you would use the vertical line with the Line Laser Level. As you stand in your house, look around. 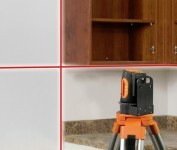 Anywhere you find surfaces that need to be level or plumb, you could use a Line Laser Level to help you with the job. 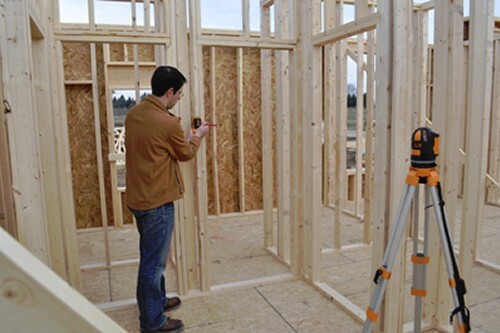 Of course, in many project applications, a traditional level will work, but what you may find is often, using a Line Laser Level will turn a two-person job into one-person job and just make the job go a lot faster. And although Johnson bubble levels (or spirit levels) are extremely accurate, their accuracy depends on the person holding the level. With most Line Laser Levels, the leveling is done automatically by the laser level, so you are guaranteed accuracy as long as your Line Laser Level is calibrated correctly. The most common accessories used with Line Laser Levels indoors are tripods (for elevation), ceiling mounts (to hold the laser on a perimeter such as installation of an acoustical ceiling) and a target (which has reflective tape to help you see the laser more easily). Outdoors, common accessories are tripods, detectors and grade rods. Applications for Line Laser Levels with a pulse mode are not limited to indoor projects; Line Laser Levels with a pulse mode are also useful outdoors. The biggest difference between working outside versus inside with a laser level is that outside, in sunlight; the human eye cannot see the laser beam of light. 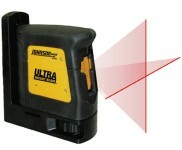 When you are working outside with a laser level, you will need to use a Line laser level Detector. 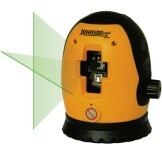 The Line laser level Detector detects the laser by reading the light as it pulses in the area. Let's take a simple outdoor application for a Line Laser Level in the pulse mode first. Instead of a chair rail around a room, you are putting in deck in your backyard. 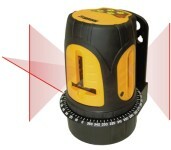 The Line Laser Level in the pulse mode can be used to the side of the area for the deck and set up on a tripod, can be used with a Detector to establish the height of the deck's floor. Once completed, the tripod can be elevated to again be used with a Detector to build a level wall or rail around the deck. Other outdoor applications for Line Laser Levels in the pulse mode can be rough and fine grading, where a grade rod is needed; rough and fine excavating, again using a grade rod to know how deep to dig and that your dig is level; alignment of concrete forms to make sure they are level across the area to be build upon; and setting up drainage where a slope feature of the Line Laser Level would be needed. Again, the key to using a Line Laser Level is it takes only one person to operate and the job will get done faster. Imagine a drainage project where a particular slope was needed across 300 feet. 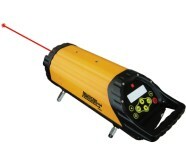 By turning on the laser level, one person can then begin to work with a Detector to stake out the rest of the job. Without a Line Laser Level, the same project would take two people. One person would stand where the laser would be and the other person would stake out the work. When working outside with a Line Laser Level, there are typically three accessories you will need: a Line Laser Detector or receiver that detects the laser beam when the human eye cannot; a tripod to hold the laser; and for grading projects, a grade rod to measure changes in elevation. With your Line Laser Level, you may have some additional features beyond just a 180-degree beam of light horizontally and vertically. First, some Line Laser Levels have a second and third vertical line. Some Line Lasers have one horizontal line, one vertical line, a second 360-degree vertical line with a plumb dot giving four cross lines.